Chris Waite was on his first trip with a new IRW Slider pole and Newell 646 reel loaded with 80-lb test Sufix line when his 104.2-lb ulua struck. On this trip to the Puna Coast was his girlfriend Kuulei Mello. She had chosen the lucky wrappings on Chris' new pole. 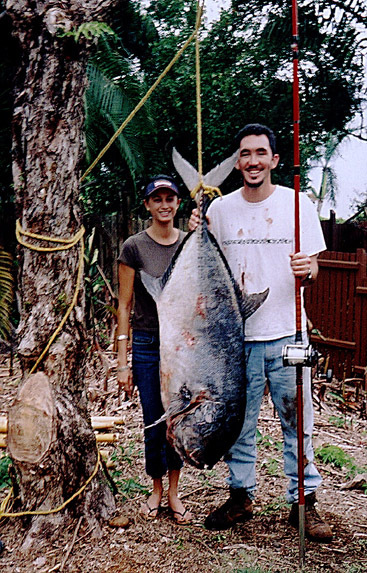 The whole story of Chris' battle with the ulua was published in the April 2004 issue of Hawaii Fishing News and authored by TV personality Mike Sakamoto.